Nationally, nonwhite voters made up 28% of all voters, up from 26% in 2008. Obama won 80% of these voters, the same as four years ago. Obama’s support from nonwhites was a critical factor in battleground states, especially Ohio and Florida. In Ohio, blacks were 15% of the electorate, up from 11% in 2008. In Florida, Hispanics were 17% of the electorate, a slight increase from 14% in 2008. While minority compositional gains were not huge, they offset a strong tilt against Obama among white voters. Nationally, Romney won the white vote, 59% to 39%. Owing to comparatively strong turnout from Obama’s base, the composition of the electorate in 2012 was strikingly similar to that of four years ago: Nationally, Democrats made up 38% of all voters, Republicans 32% and independents 24%. This enabled Obama to win re-election even though he lost the independent vote. Romney won independents by a 50% to 46% margin. Four years ago, Obama carried independents by 52% to 44%. Evidence of the demographic transformation of the electorate is seen in the profiles of each candidate’s supporters: Fully 89% of Romney’s were white non-Hispanics, compared with just 56% of Obama’s supporters. 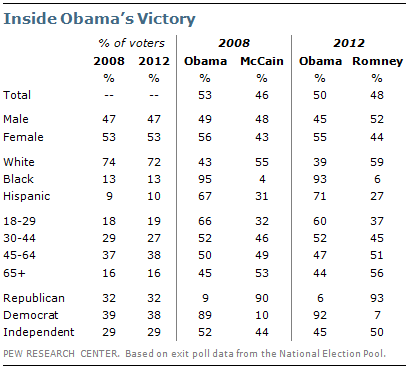 Romney managed to better McCain’s showing among whites by four percentage points – and still lost the election. Continued support from women was also an important factor that helped Obama stay above water in the swing states of Florida, Virginia and Ohio. He held or improved his 2008 margins among women in all three states, while losing support among men. Nationally, Obama won women voters by nearly as much he did in 2008. Obama’s advantages among women, minorities and young people helped offset his continued weakness among white voters. Obama’s falloff in white support was broad-based, crossing many demographics – working class whites, college graduates and even women. The economy was clearly the dominant issue of the election, but the extent to which voters held Obama accountable for their economic frustrations was limited. Nationally, 59% said the economy is the most important issue facing the country, but voters overall were divided over which candidate could do a better job on the issue: 48% said Obama, while 49% said Romney. 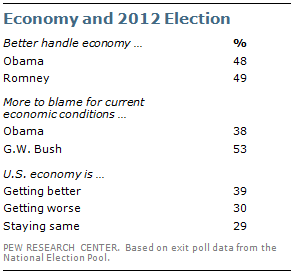 However, by a 53% to 38% margin, voters blamed Bush, not Obama, for the economic problems the nation is facing. Obama also was aided by nascent economic optimism. By a 39% to 30% margin, more said the national economy is getting better rather than getting worse, and given the very strong correlation between that opinion and vote choice, that cut in Obama’s favor. When it comes to how people feel about their own financial situation, more said they are worse off today than four years ago than better off, and most of those who expressed that opinion supported Romney. Yet importantly, a plurality of voters (41%) said they are doing the about same today as four years ago. These voters backed Obama by a wide margin (58%-40%). Voters’ views of Obama were similar to those of George W. Bush eight years ago. After falling below 50% in job approval for much of the year, he reached 53% approval on Election Day – the same as Bush’s in 2004. The biggest national trend in Romney’s favor was the public’s distaste for more expansive government. More voters said government is doing too many things than said government should do more, by 51% to 43%. But a populist streak regarding the lack of fairness in the system cuts the opposite way. Most voters (55%) say the U.S. economic system generally favors the wealthy, compared with 39% who say it is fair to most Americans. And a majority thought that Romney’s policies would favor the rich, while a plurality thought Obama policies would favor the middle class. Romney improved his personal image substantially over the course of the campaign, but in the end he still was not as viewed as favorably as Obama. The national exit polls found that 47% viewed Romney favorably, up substantially from a low of 29% of registered voters in March during the bruising GOP primary. However, on Election Day, 53% viewed Obama favorably.